Note: I have made corrections in the thread. I have to "field test" my concept, before I "buy more stuff". I will pitch the tarp near a small "warming fire" and see about it. My preference would be the "gold" color and I'd stay with the straight seams. flapping in the breeze gives it character I like easy!! It isn't so difficult to make a catenary-cut seam. If you suspend the fabric (basted stitch) between two nails on a wall, the drape is the curve. If you use a seamstress's chalk, or similiar, you can mark "the line". Then, you simply stitch "on the line". There used to be a little wheel and special colored "carbon paper" for marking pattern lines. Maybe still is? I thought I would mention this much detail, for people who have not "seam-sealed" their tarp, or tent, before: Oware recommends McNett or G.E. Silicone II. I purchased 7 ounce G.E. Silicone II at the hardware store. I found out, online, the silicone is diluted with "odorless mineral spirits" and it is best to mix it with a paint mix attachment for a household drill. I can report it gets "silky smooth" and it goes on nice and easy. I tried an "acid brush" and a small-size synthetic sponge brush. I think I like the small-size synthetic sponge brush best, because I am not doing a big job. I just angle it, and covered the stitched threads on both sides. Note: I had the tarp stretched for each seam. It is also recommended practice. I didn't need to use cornstarch for stickiness after the curing time. I can see this Oware AsymTarp 1 SilNylon is a much better product than the first SilNylon fabric made. The silicone seems to penetrate the fiber and silicone is present on both sides, not only one side. I wonder if it will still stretch like the first SilNylon? Will I need elastic tensioners in the tie-outs? It is easy, for me, to pitch the Oware AsymTarp 1 with a taut pitch. I thought the thread used in the seams was a bit heavy, but it gives me confidence to pull it taut. I think I am liking this lightweight tarp. In addition, the dirt nicely wipes off with a sponge, that is a "plus". I cannot do that with my much more expensive tents. I like this newer version of SilNylon. The first SilNylon was a "sand magnet". This SilNylon doesn't seem to know the sand is blowing everywhere, here, when there is a little wind. click on "start" look for "recent documents" and click on it. See if you can find it listed there. If it is the spreadsheet I found, just now, by "Googling". I recommend reading http://www.backpackinglight.com/cgi-bin ... ad_id=1543 because catenary-cut refers to two different kinds of curves. 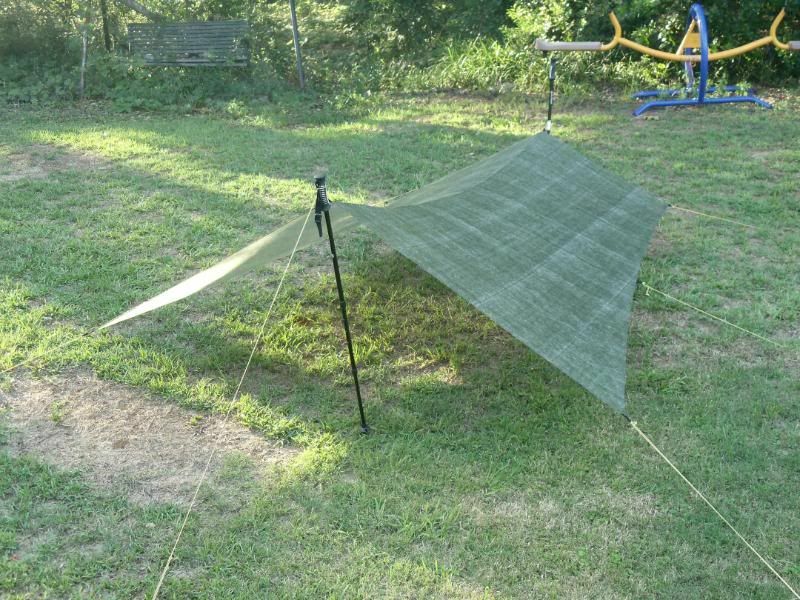 Oware AsmyTarp 1 is follow-up on Hybrid tarp I started viewtopic.php?f=3&t=5186 I want to have. The idea is to have a reflective surface inside one side of the tarp reflect the warmth off a small fire. The pitch of the tarp, he demonstrates, is what makes it work. Mylar sheet (flaps around if there is any wind: sleepless night, for sure) but the fire would be attended. Metallized Tyvek http://www.materialconcepts.com/products/tyvek/uv-soft/ can make tarp. 70d Metallic Ripstop http://www.seattlefabrics.com/nylons.html is available in shiny or dull. The last two may be used to make the tarp. I am considering Metallized Ripstop on only one side because a tarp needs to breathe. I prefer DWR, because it can be re-treated without any special skills or equipment. I spent $$ for the Oware AsmyTarp 1 for a good reason: if you pitch one side down to the ground, the other side more naturally pitches one end of one side up away from the ground. That side could have sticks or trekking poles more readily prop it to an adjustable-height to catch the radiant heat of the fire. 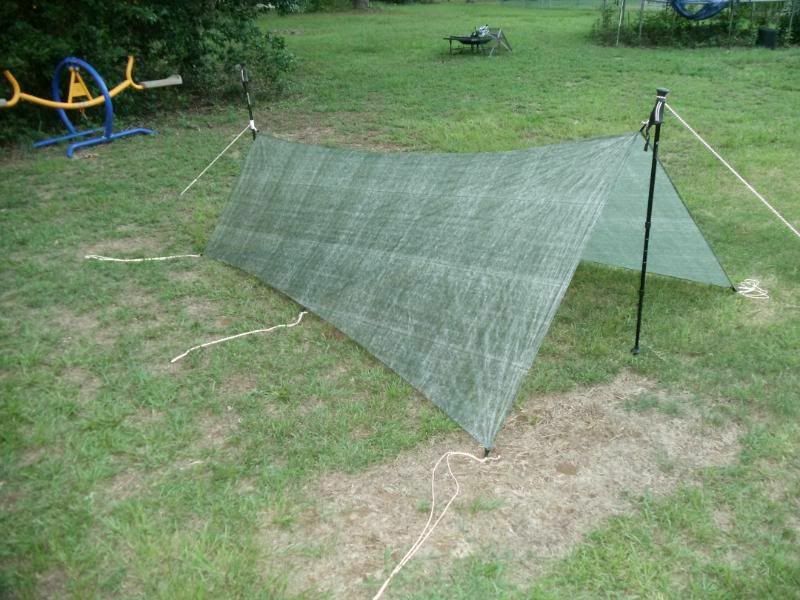 If the side pitched down to the ground was metallized Tyvek or Metallized nylon home-treated on the exterior side with SilNylon, it may be the durable, lightweight and low-volume emergency tarp to be used with an emergency bivy sack I am looking for. At my website, I encourage people when the get out of sight of the car to always have with them what they need to stay out one night or two at the minimum. It can be done with a waist pack, shoulder sling bag or a small rucksack. I would like to show it can be done, with reasonable expense, and everything used may be used for backpacking, as well. That is my goal. The reason is it is easy to get turned around. In addition, fog is the clouds in the mountains. The weather changes rapidly. Many people get too involved in sight-seeing to keep track of where they are. In addition, if people have the essentials, they are self-empowered. They are smarter. I say: read my website. But I want to show what works. Last edited by ConnieD on Mon Jan 30, 2012 2:10 pm, edited 3 times in total. thx for the link connied. also, that .xls file is the one i was talking about. I am in the process of adding front and rear closures on it out of a lighter grade of cuben to try and create the bomber winter shelter.